Georgia State (16-15, 5-6) swept Arkansas State in a three-game Sun Belt Conference series. The conference sweep is the first for the Panthers since winning three games against Louisiana Monroe in April 2015. The Panthers trailed for only one inning during the three games, outscoring the Red Wolves 31-12. Nick Gatewood led the charge with seven RBIs, six runs, five hits and three walks on 5-11 hitting. “That’s huge, I don’t think since I’ve been here we’ve swept a team in conference, so you know that’s big to show where we’re going as a team and what we can accomplish,” Gatewood said. The first game of the series was a 12-3 victory. Brandon Bell hit for just the second cycle in Georgia State history. 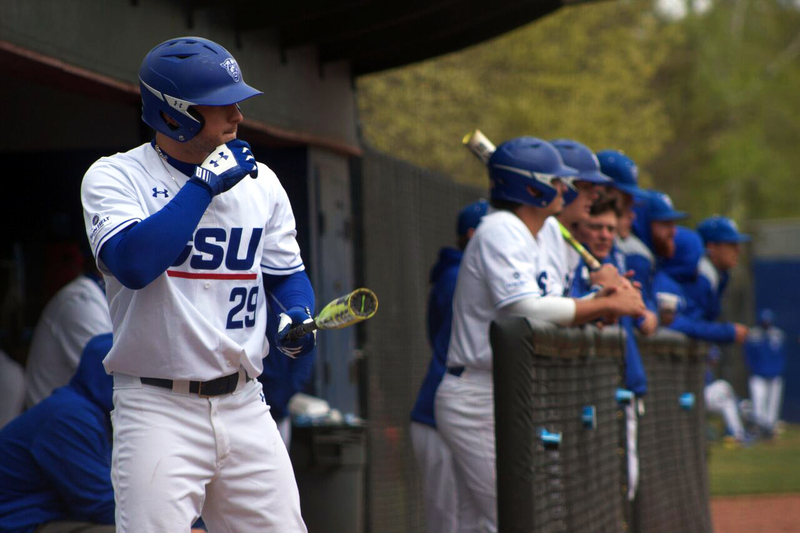 Georgia State also hit great the next game, defeating the Red Wolves 16-7 in wire-to-wire fashion behind a grand slam and five RBIs from Luke Leonard. However, Jordan Lee displayed the talent of the weekend pitchers during the series finale 3-2 win. Lee threw seven strikeouts thanks to a dominant fastball, slider and changeup. He allowed just two runs and three hits in 7.1 innings. “Obviously I can’t emphasize enough how well my defense played behind me, especially Nick Gatewood behind the plate. He really set things up and caught hard for us,” Lee said. Gatewood’s ability to contort his body enables Lee and other pitchers to throw balls many pitchers aren’t able to. His hitting also gives his teammates more incentive to reach base because he can bring in runs at a high clip. His .385 batting average and 35 RBIs rank him third in the conference. The Panthers need to continue hitting and pitching to gain ground in the Sun Belt Conference East Division standings. Their three-game home series against Texas State (17-14-1, 5-7) begins Friday, April 13. With both teams sitting in the bottom half of their divisions, the series could be an indicator of how the seasons unfolds. Georgia State travels to face Georgia Tech on Wednesday, April 11 at 6:00 p.m. in a game they badly want to win. “We swung it really well the first two games, so I hope we can keep going and do that especially against Tech because we really want to win against them and we pitched really well this weekend, so we definitely want to keep that going,” Lee said.